I just returned from a 4 day Eastern Caribbean cruise on the Ruby Princess, stopping in the Bahamas and Turks & Caicos. I had uber-relaxing vacation; sunning, reading and of course, eating. I won’t bore you with the details of the food on the boat – it was inconsistent. I will say that highlights were: fresh croissants for breakfast in the dining room, scones with clotted cram and jam during afternoon tea, gelato and surprisingly decent pizza. If you are on this boat, you should avoid the eggs (always over cooked) and sushi (the worst sushi rice ever). I would list Princess as 3rd in my ranking of cruise lines (Celebrity, Royal Caribbean, Princess, Holland America and Norwegian). Carol and I disembarked at 8am and had the whole day in Miami before flying home. 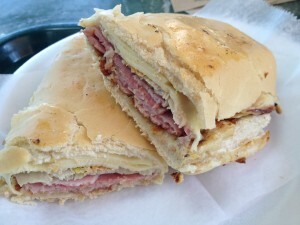 We spent the day on the beach and driving around to Miami’s top Cuban sandwich joints. Las Olas Café was our first stop. It is a simple corner take-out shop, with a counter filled with pork shoulder, rice and beans and other delicious looking Cuban fare, ready to be served. The sandwich was a steal at $5 and it was the best of the day. It had the best roasted pork, as well as crusty bread. The sandwich is heated on the plancha open-faced and then put together and pressed a second time, ensuring melty cheese and a crunchy top. The sandwich was strangely cut in to four quarters, both length and widthwise. Puerto Sagua has been around for 47 years and looks like it. It is a dark wood paneled diner with a long wraparound counter top. 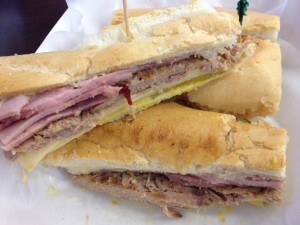 The Cubano comes in medium and large sizes ($8, and $9, respectively). I was disappointed; I found the bread to be cottony and the roast pork was not flavorful. I did glimpse a delicious looking flan, but with another sandwich to try, I had no room to allocate to dessert. Versailles proclaims itself to be the “world’s most famous Cuban restaurant” and has been open since 1971. We opted to have our sandwich to go, rather than in the dining room. There is a long bakery counter filled with tempting baked goods and desserts. I could not resist a tre leches cake to go with my sandwich ($6). 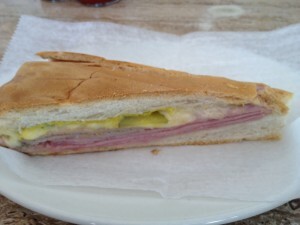 This was my least favorite Cubano of the three. The bread was also cottony, but the biggest problem was the sandwich did not get enough plancha time. The cheese was not even melted! The tres leche cake was decent, but not the best. 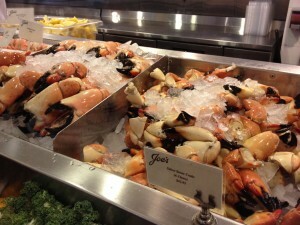 You would think that half of 3 sandwiches would put me out of commission, but I could not leave Miami without trying Joe’s Stone Crab, which has been around for 101 years. The main restaurant was not open till dinner, but the take-away counter enabled us to get an order of medium claws (7 for $30). The market price goes up as you get larger sized claws. They were simply steamed; served cold with clarified butter and mustard sauce. They were delicious – a perfect example of how simple preparation can let a great ingredient shine. Some of my best meals have involved a bushel of steamed crab and butter – this was no exception.